Especially in cases where an enterprise is multi-homed with it’s own block of network addresses, it may become necessary to configure dynamic routing between network service providers. This is accomplished by use of external BGP (eBGP). 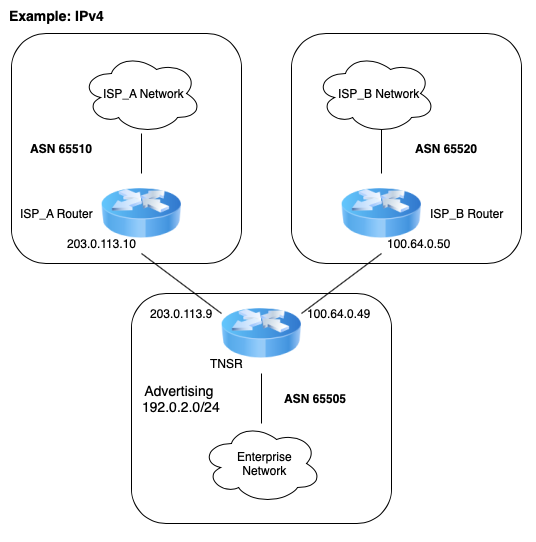 In this use case, the enterprise will use TNSR to speak eBGP with two network service providers, in order to exchange routes which may be redistributed from static/connected routing. In this example, the enterprise using TNSR will have a fictitious autonomous system number (ASN) of 65505. 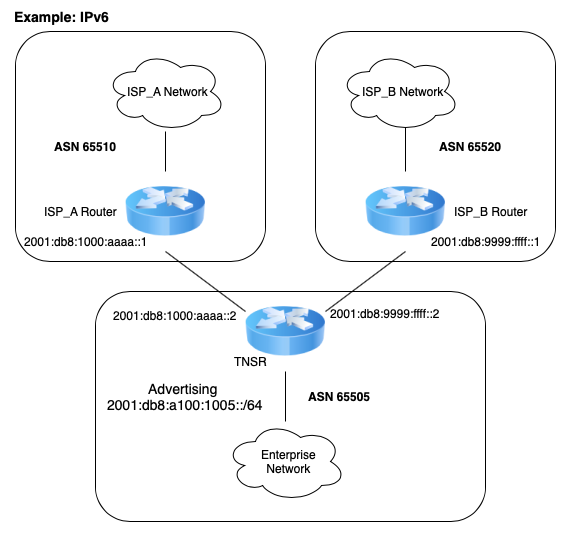 The network service providers in this example will have ASNs of 65510 and 65520. The enterprise using TNSR will redistribute a single /24 network from static into BGP. That network will then be advertised to each of the service providers. The service providers will announce a full routing table to the TNSR instance. tnsr(config-interface)# description "To ISP A"
tnsr(config-interface)# description "To ISP B"
tnsr(config-prefix-list)# description "IPv4 Routes to Export"
tnsr(config-prefix-list)# description "IPv6 Routes to Export"